It used to be that most credit-mongering was waged between us and our competitors in other labs, and kudos came when we got our papers published before they got theirs. But somewhere along the way an asterisk next to an author’s name to provide additional information (like the emoticon to indicate when something is a joke) got invented and changed the battlefield. The asterisk enables us to take our battles for credit to our fellow lab members, paper by paper, lab member by lab member. A typical skirmish ends with an asterisk next to the names of the first two (or three, or four, or even more) authors – on what is often a much longer complete list of co-authors. The asterisk means: “These authors contributed equally.” At the tail end of the list, two (or more) senior authors have other marks to indicate their co-correspondentness. Another part of my argument was that second and third authors are game for asterisking their names whenever they did major – if not quite the largest – shares of the work, but seem much less eager to apportion exact credit when their roles were more minimal. The second author not only had a minimal contribution to this paper, his argumentative stands and negative tone set the work back nearly a year. We wouldn’t even have included him as co-author if he hadn’t threatened a lawsuit. 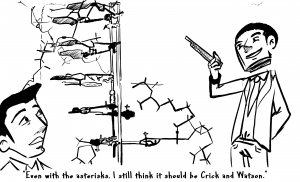 ♠ The first author did virtually all of the work, but allowed the authors in positions 2 through 7 to appear because she owed them big-time for bringing pizza to the lab late at night when her experiments ran long. The second and third authors – with the asterisks next to their names like the first author – gimme a break. ♦ The third author carried out most of the computational analyses, which the first two authors are still struggling to understand. ♥ The last three authors are PIs of the labs in which the work was done. One of them first saw the manuscript a day before its submission but couldn’t squeeze in a reading of it because he was off to a meeting in Majorca; another got it a week earlier but was too busy planning a major conference to read more than the abstract; the third read the whole thing (albeit while she was on a conference call to review grant applications). ◊ The first six authors contributed equally. Yes, exactly 16% and change per author, +/- 0.01%. You can scramble them up to revise the order any way you choose and not one of them will complain (in fact, we’re going to see if the journal can do that each time the PDF is downloaded). ∇ The listing of Smith (the first asterisked co-author) is being challenged by Jones (the second asterisked co-author). After publication, we realized that the authorship instead rightfully should be Jones (asterisk) and Smith (asterisk) in that order. Please change the citation to reflect this re-authoring if you refer to this article in your publications. Wait! We just held a series of meetings with the other co-authors, and their collective view is that it should be, as originally written, Smith and Jones in that order. Please change your citations back. Wait! Jones just brought out his dated notebooks showing when the key ideas arose. Disclaimer: all authorship explanations in this post are fictitious; any resemblance to real lab personnel, living or dead, is purely coincidental.